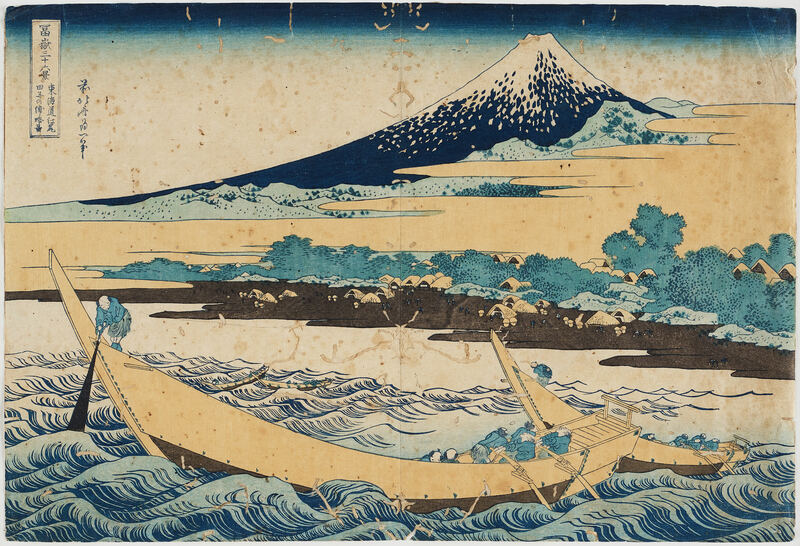 KATSUSHIKA HOKUSAI (1760–1849), after, color woodblock print. 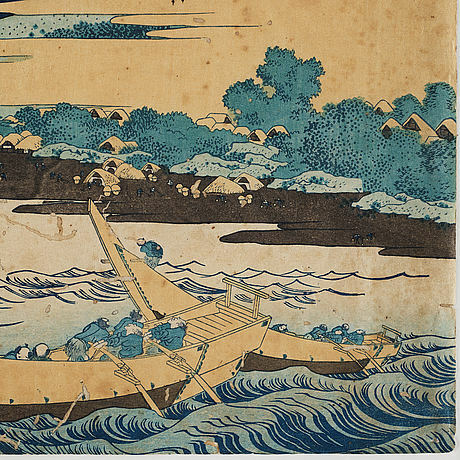 Japan, "Tago Bay", 19th century. 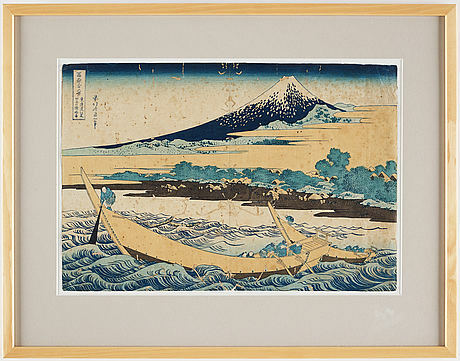 Depicting the Taganoura Bay near Ejiri on the Tokaido, two boats working through the waves off the coastline, from the series "Thirty six views of Mt. 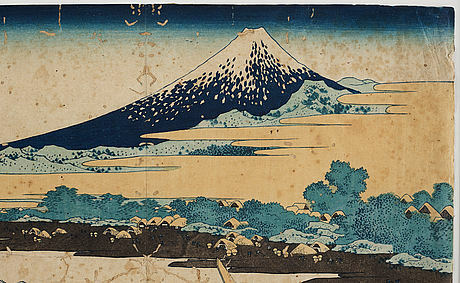 Fuji". 25 x 36,5 cm. 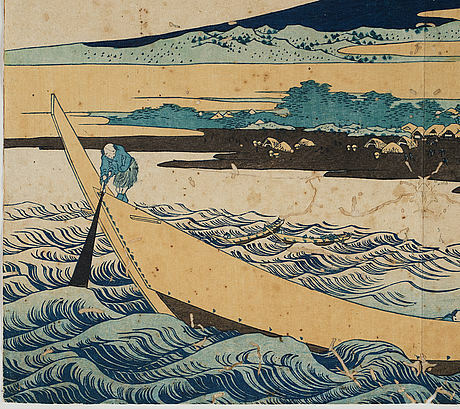 Also at Sotheby's, London, IMPORTANT JAPANESE PRINTS, ILLUSTRATED BOOKS & PAINTINGS FROM THE ADOLPHE STOCLET COLLECTION, Jun 2004, lot 361; Sotheby's New York, JAPANESE WORKS OF ART, Jun 1993, lot 307. 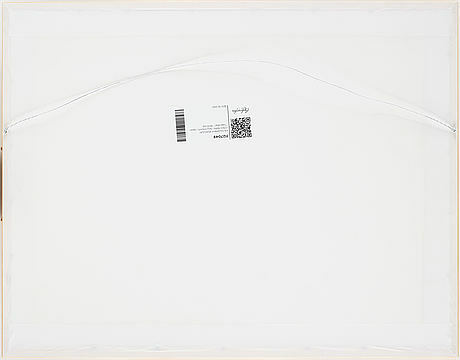 Library of Congress, nr 2008661005 and 2008660141. The Metropolitan Museum of Art, nr JP1288 and JP2976. Museum of Fine Arts Boston, nr 34.318 and 11.17536. Not examined out of frame. Faded. Damages. Worming. Stains. Discolourations. Damaged edges. 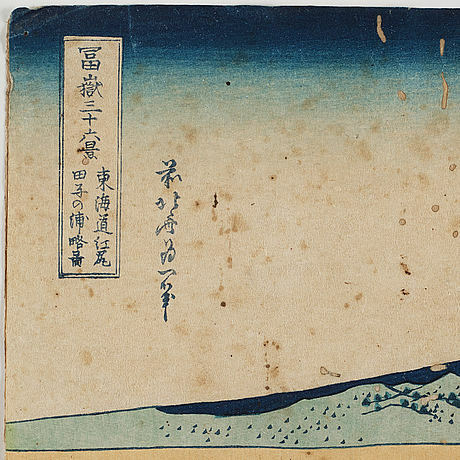 Binyon, Laurence, A Catalogue of Japanese & Chinese Woodcuts Preserved in the Sub-Department of Oriental Prints and Drawings in the British Museum, London, UK, BMP, 1916, page 130; Clark, Timothy, 100 Views of Mount Fuji, London, BMP, 2001, page 60.